Finally.... A loooooong shelf support for special circumstances! With an unheard of length of 1-3/4", this 5mm shelf support will prove invaluable for lots of special conditions. They can be put completely through a center divider and still project 1/2" from BOTH sides of it. They could also be put to good use if your shelves are for some reason cut too short for the width of the cabinet. Concerned with the potential of tear-out under heavy loads? Now you can drill a 5mm hole as deep as the cabinet side will allow, giving the pin more than enough "bite" in the cabinet. And while all that's true, there are many folks who want to a stand alone design statement, and use them as they would an ordinary shelf pin. These shelf pins have a beautiful polished nickel finish that will enhance the look of all fine furniture. The have a "minimalist" design to them, great for environments where "less is more" is the theme. Slight tapers on either end makes installation easier and lends a bit of refinement to an already sleek appearance. 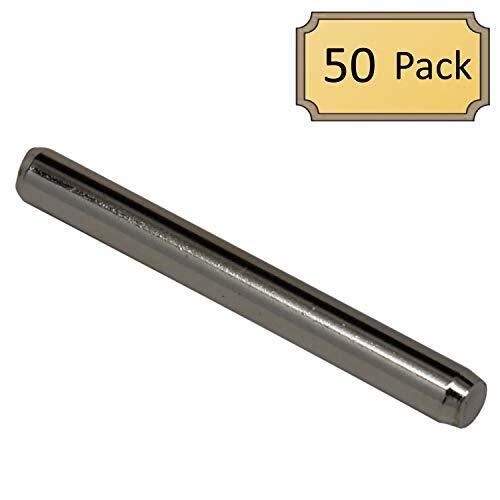 - 1 Package of Extra Long Cylinder Shelf Supports - Polished Nickel - 50 Pcs. EXTRA LONG LENGTH - Indispensable for circumstances where you need additional length! BEAUTIFUL FINISH AND SHAPE - Plated in polished nickel. Streamlined appearance goes especially well with contemporary cabinetry. FORM & FUNCTION - Tapered ends add a hint of detail to an otherwise minimalist design, while also making installation a breeze.